Bernini’s Little Elephant | Where's my backpack? You don’t have to look far to find Gian Lorenzo Bernini’s legacy in Rome. Evidence of his genius is everywhere, from the fountain at the base of the Spanish Steps to the sculptures in the Chigi chapel and the Ponte Sant’Angelo. His sculptures of popes, cherubs and mythological figures brim with vigour and passion, but my absolute favourite of his sculptures is much more low key. Tucked in neatly behind the Pantheon there is a gem of a Gothic church called Santa Maria sopra Minerva (St. Mary above Minerva). The name comes from the location; it was built in 1280 over the site of a temple to Minerva. The church itself houses a wealth of extraordinary art but my heart broke into a million tiny pieces at the sight of Bernini’s little elephant standing at the bottom of the obelisk in the piazza outside. 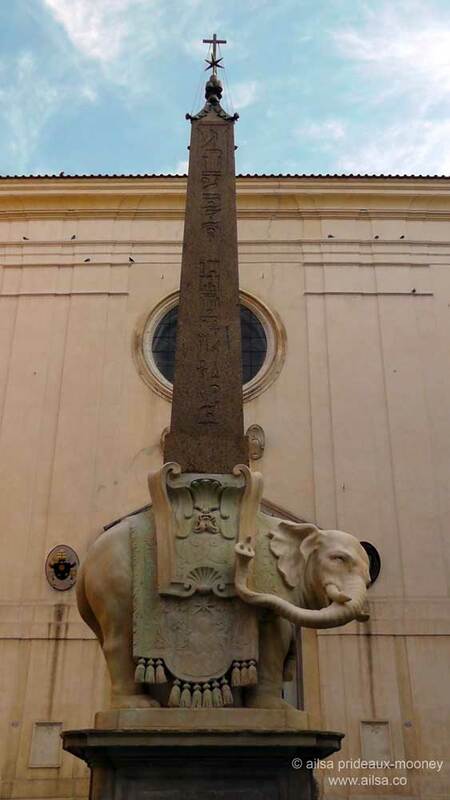 Officially known as Elephant and Obelisk, it was commissioned by Pope Alexander VII when an obelisk was discovered in the garden of the adjacent Dominican monastery in 1665. Not only was the church built above a temple to Minerva; it would appear the temple to Minerva was built above or near an Iseum, an Egyptian-inspired cult worshipping the goddesses Isis and Serapis.For some reason the pope wanted the obelisk displayed in the piazza and called for architects to submit designs for the base of the obelisk. One of those submitting a design was a Dominican priest by the name of Father Domenico Paglia. His design was rejected in favour of Bernini’s elephant. 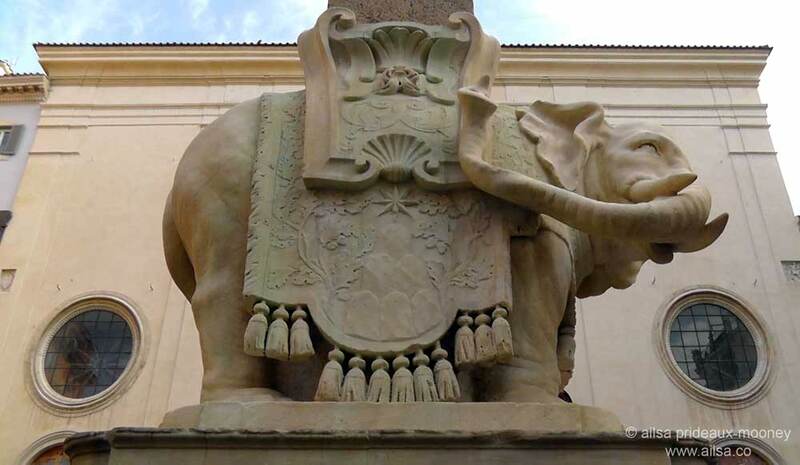 When Bernini’s design was unveiled, Father Paglia, perhaps still smarting from his rejection, raised concerns about the stability and Bernini was forced to place a supporting block underneath the elephant’s torso. Bernini tried to obscure the block by adding the ornate saddle with tassels that hung down low but that made the elephant look squat and dumpy and he was never happy with the end result. It was said that he would avert his gaze when he passed by, and he omitted it from the list of his life’s work. Local Romans wasted no time making fun of the stocky little elephant, christening it Porcino della Minerva (Minerva’s piglet). Over the years it has morphed into Pulcino della Minerva (Minerva’s chick) – which it is still affectionately referred to as today. A striking feature of the sculpture is the elephant’s head, turned quite markedly away from the church, leading some to speculate upon its meaning. It was here in 1633 that Galileo Galilei was summoned, held and interrogated by the infamous Inquisition in the adjacent Dominican monastery and forced to recant. There are those who believe the elephant’s shunning of the church was Bernini’s way of condemning their treatment of Galileo. Bernini did manage to get his own back on the meddling Dominican priest. The statue is placed carefully in the Piazza della Minerva with its rear end facing the Dominican monastery. The elephant’s tail is shifted ever so delicately to the left, so every time Father Paglia exited the monastery, he was greeted with a very clear view of the elephant’s nether regions. This entry was posted in Europe, Italy, Photography, Travel and tagged art, humor, photography, photos, pictures, travel, writing. Bookmark the permalink. Great post Ailsa, I must return to Rome and visit Bernini’s elephant! Nice storytelling. Seems like Bernini got the last word in this battle. Your blog is always entertaining. What a fascinating sculpture and history! It is so interesting to me that the Christian Church built a lot of their big churches on top of holy sites of the more ancient religions. great sculpture and a very interesting history! something to look forward to on my next trip to rome. thank you! awe, this elephant is so cute! Besides being masterfully carved out of stone, of course 🙂 Thank you for the history and a sight-seeing lesson! Great story, thanks for an informative post! What a great elephant in a great place. May never get there so I’m especially grateful for your informative and creative post! I would love to see that in person. Thank you for sharing (and explaining) this hidden treasure. Hi Dr. J. I just signed you up with your new email address so check your gmail inbox because you should have received an email asking you to confirm your subscription. WordPress.com only allows subscribers to unsubscribe themselves – I can’t remove your old email, you have to do it yourself. Don’t worry, it’s pretty easy. Here’s how: Just go to wheresmybackpack.com and at the very top there should be the word ‘Following’ with a check mark beside it. When you hover over it with your mouse it will change into a prompt for ‘Unfollow’ – click once to unsubscribe your old email address. Once you’ve successfully unsubscribed, it will change into a prompt for ‘Follow’ – that’s when you know you have unsubscribed your old email address. Let me know if you have any difficulties.